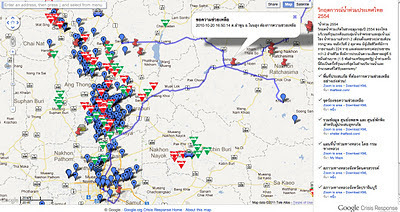 Over the last few weeks, Thai Googlers and global crisis response engineers have quite literally been working day and night to make critical information more accessible using Google’s strengths in information and technology through a crisis map, a crisis response page as well as several key partnerships and ongoing volunteer activities. 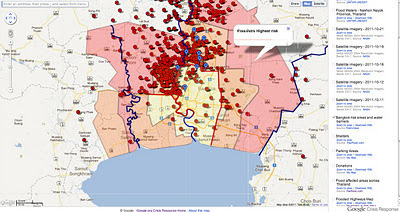 The trust that people around Thailand have placed in our products is precious to us and so today, we’re starting a series on our official Thailand blog to highlight key updates in our crisis response efforts as well as tips and tricks for getting more out of free Google products and services that we hope you will find useful during these difficult times . . .
What’s New on Google’s crisis response page and crisis response map? 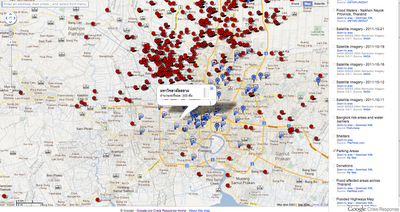 The information and images available on the Google crisis map represent a combination of official data, for example satellite images from NASA, radar images from Unistar-Unosat and traffic information from the Department of Highways as well as user generated content like the number of beds available in emergency shelters in and around Bangkok or photos uploaded from Android phones. Satellite imagery from NASA and radar imagery from Unitar - Unosat indicate the extent of flooding and affected areas across the country. Daily updates are now available for those seeking emergency accommodation. The green housing icon indicates the location of shelters in and around Bangkok, the capacity the shelter can accommodation and the amount of places still available. 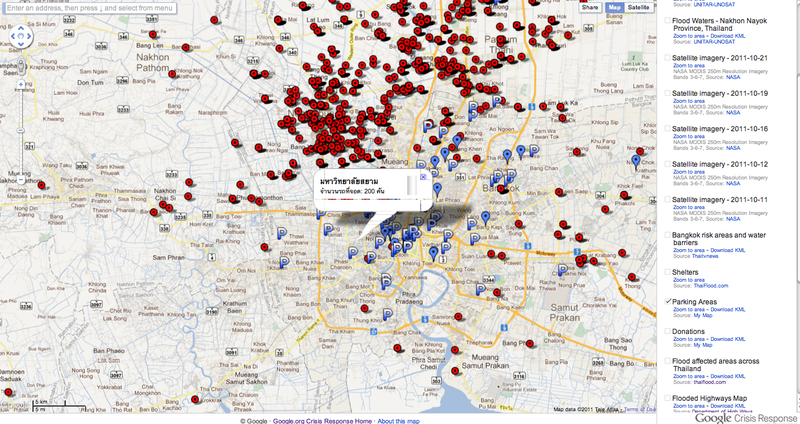 Crossed out icons indicate shelters at full capacity. 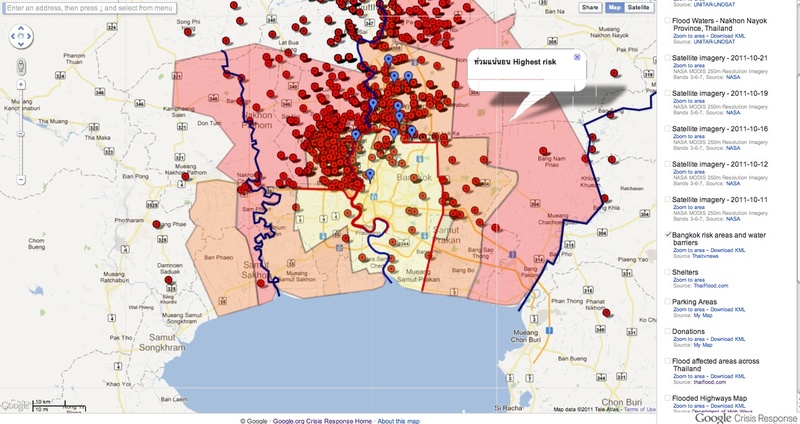 One feature provided by ThaiTV news has received a lot of visitors indicates Bangkok areas at risk of flooding through a red - flooded, orange - high risk and yellow - medium risk colour coded may layer. 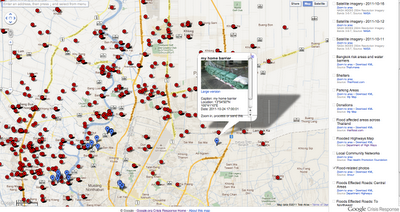 This feature also shows flood barriers along the Chao Praya River as well as the eastern and western canals being used as diversion routes for water overflow. 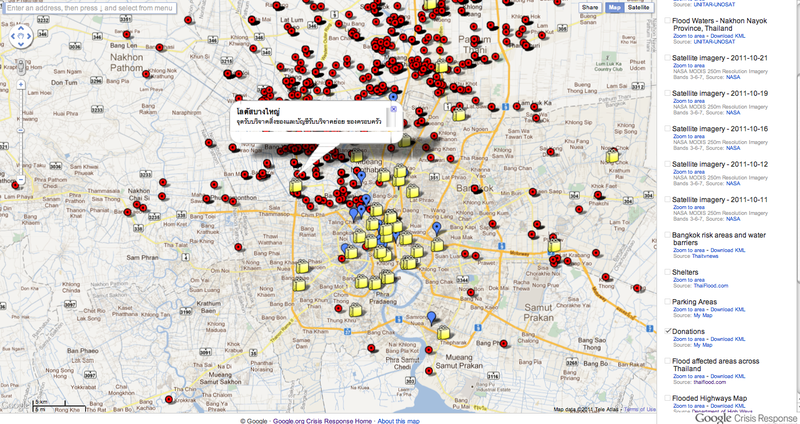 By using the map zoom in feature, Bangkok residents can identify their street or nearby areas. Users have identified parking spaces for those seeking a safe location for their vehicles. By clicking on the P icon, as shown below, information is provided on the total capacity of car parks and the number of spaces still available as of the date of posting. If you are looking for a way to help your fellow Thais, donation centers are identified through the shopping bag icons below. 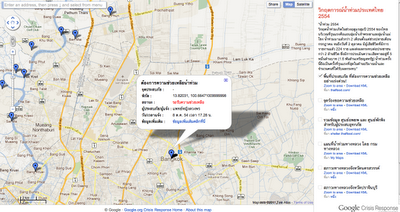 By clicking on an icon you can find the name of the donation center, it’s address and where available, a phone number. We advise anyone planning on visiting a donation center to volunteer or drop off goods to call in advance and confirm the center is open during the public holidays. 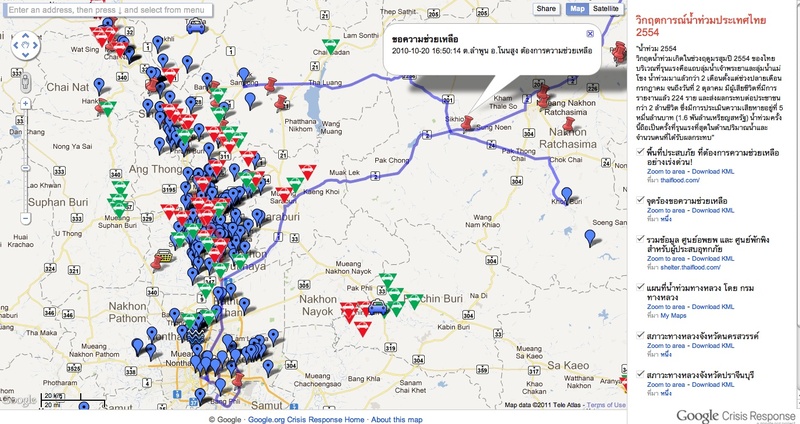 Users, with the help of a special application by Ansur, have recently begun sharing photos taken on Android phones as a new layer to the crisis map. We are working with this user group to share more information for those interested in sharing photos taken from their phones and will provide additional information as soon as it is available. 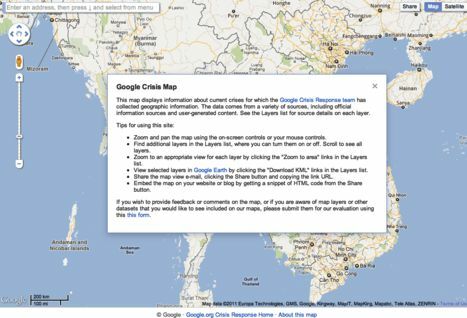 If you are interested in finding out how high your area is above sea level, a Google Earth feature called Elevation can help. Simply download Google Earth on your desktop, mobile or tablet and get started by selecting your 3D viewing preferences to show elevation. 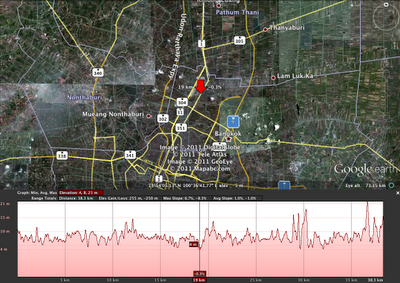 Elevation measurement units default in feet and miles but units can be customized. As you move the mouse pointer in the 3D viewer, the elevation of the terrain beneath the pointer is displayed in the lower left corner of the 3D viewer. By default, the display of elevation is in feet and miles when high enough. 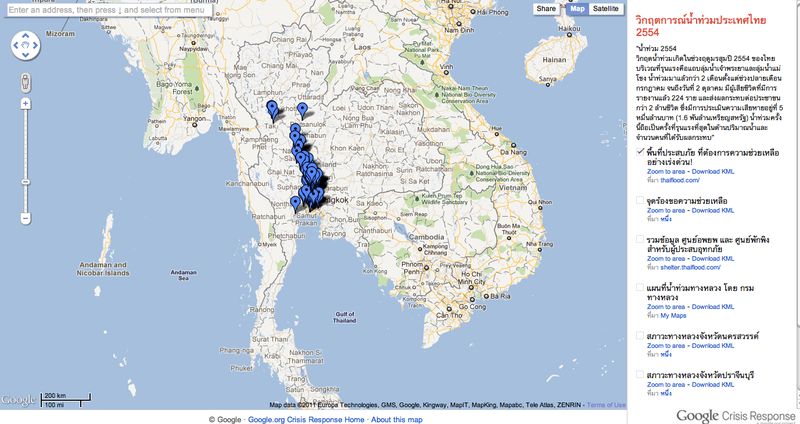 A new feature is now available to help Thai Gmail users stay connected by sending and receiving SMS text messages from within Gmail Chat to connected phones anywhere in Thailand. 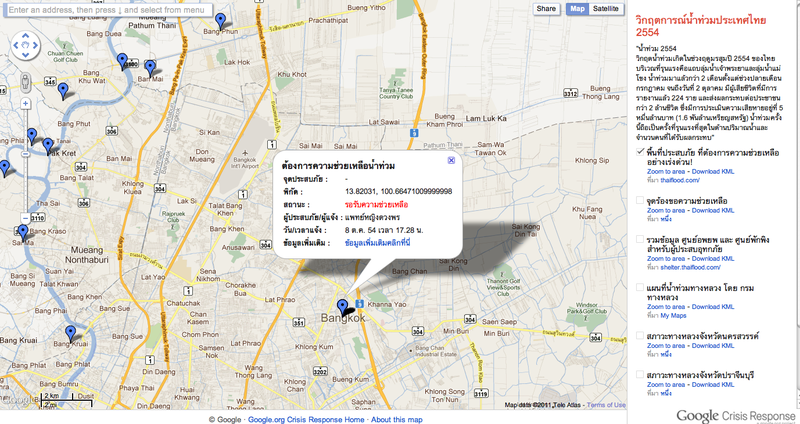 With SMS text messages right from Gmail: you chat from your computer, and your friends can reply from their mobile phones if they are subscribers to DTAC or True. Like any other feature in Gmail, sending SMS messages from Gmail is completely free. When your friend replies from their phone, this will be charged at the regular SMS rate. 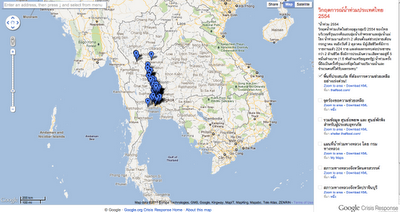 If you are you outside of Thailand and want to use Gmail to send free SMSes to your friends in Thailand? Just go into Settings->Labs in Gmail, and enable both labs that have the word "SMS" in their description. Once again, we would like to thank the emergency services personnel and volunteers for everything they are doing to help our Thai brothers and sisters. Difficult times like these provide an opportunity for people to come together and Google remains committed to doing our part, in partnership with the many agencies involved in the crisis response. 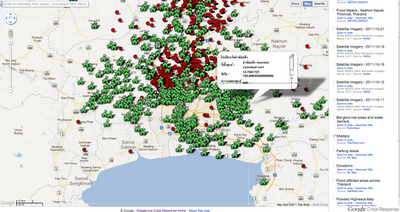 Google’s mission is to organize the world‘s information and make it universally accessible and useful. In times of natural disaster, this mission gives Googlers around the world a way to focus our energy and passion and guide our efforts through Google Crisis Response.